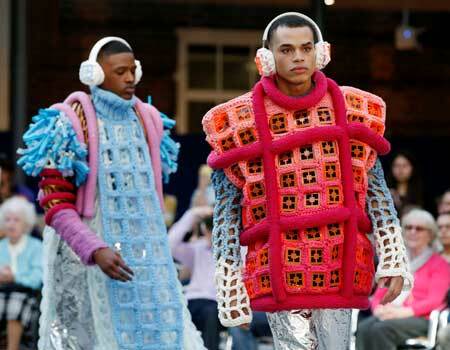 Students in their third year of Fashion Design and Fashion Textiles showcased their creations to an eager audience at an end-of-year show held at Middlesex University’s Hendon campus last week. The culmination of months of hard work and long hours in the University's fashion studios, the end-of-year display is a highlight of Middlesex's event calendar. This year's line-up of designs saw 64 students play with proportions, innovate with materials and incorporate striking prints into a diverse, exciting series of collections. The show was attended by an industry judging panel – Hunger magazine's Fashion Director Kim Howells, fashion designer and creative consultant Keko Hainswheeler, Wonderland magazine stylist Matthew Josephs and Kiko Simōes, international events manager at Vivienne Westwood – who were tasked with selecting 19 students to exhibit at a fashion show for press and buyers at the end of May. The panel praised the students for their high level of technical execution and creativity, and commented on show-worthy garments being underpinned by sellable, wearable pieces. 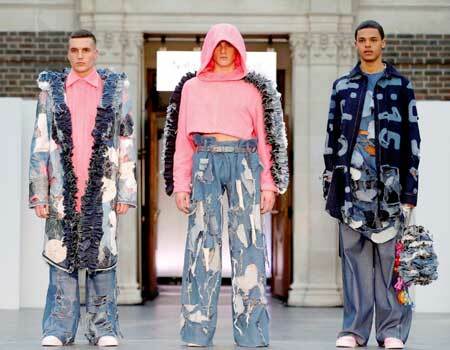 Fashion Textiles student Natalie Broughall took inspiration from 'Bronies', men who love My Little Pony, for her collection – which combines denim, towelling, plastic and glitter to playful, fun effect. "I love working with denim; it's a versatile fabric and you can do a lot with it," Natalie said. "While working on this collection I learnt a lot about myself and my aesthetic, what I enjoy about making, what I want from a garment. I also learnt about pattern cutting and surface texture. The final year teaches you a lot in terms of your skills and style." Fellow Fashion Textiles student Jessica Brown, who specialises in knitwear design, created a Tron-inspired collection incorporating British wool, coloured nylon-stuffed Italian yarn and crin – the result of more than 100 solid hours of making in the two week lead-up to the show. "It's really exciting to see it all together," she said of her reaction to seeing her creations on stage. "The atmosphere is fantastic and we're all supporting each other." "It's hard to describe when you see your work from a different perspective," said Fashion Design student Antonio Cascione, whose womenswear collection evokes the decadence and grandeur of the life of Marie Antoinette but gives it a contemporary twist. "Normally you only see your work behind-the-scenes. To see it from the first row is amazing." Antonio praised Middlesex for the support he received during his studies, particularly from those he worked with most closely in the studios. "It's been an amazing experience; I've learnt a lot. I think we have one of the best courses in the UK. The technicians and tutors provide you with all the support you can imagine, and the amount of time they spend with you is amazing." Also exhibiting her work was Olivia Overton, who is a finalist in the British Fashion Council's Burberry competition and the Fashion Awareness Direct (FAD) competition. She is now in the running for a £2000 prize from the British Council and an internship at Burberry. Her final year 'Sunday Best' collection references the Victorian tradition of Sunday attire, fused with African influences and a sportswear aesthetic. The 19 selected designers who will exhibit at the end of May will be revealed in the coming weeks. Take a look at our Facebook gallery for more images from our impressive showcase.